Around the start of the new year, I pulled out every single project I have in the works and considered whether I wanted to continue with them, whether the finished item was something I genuinely want in my life (something that will “spark joy,” as Japanese master of tidying Marie Kondo says). These are the projects that didn’t make it into 2015. 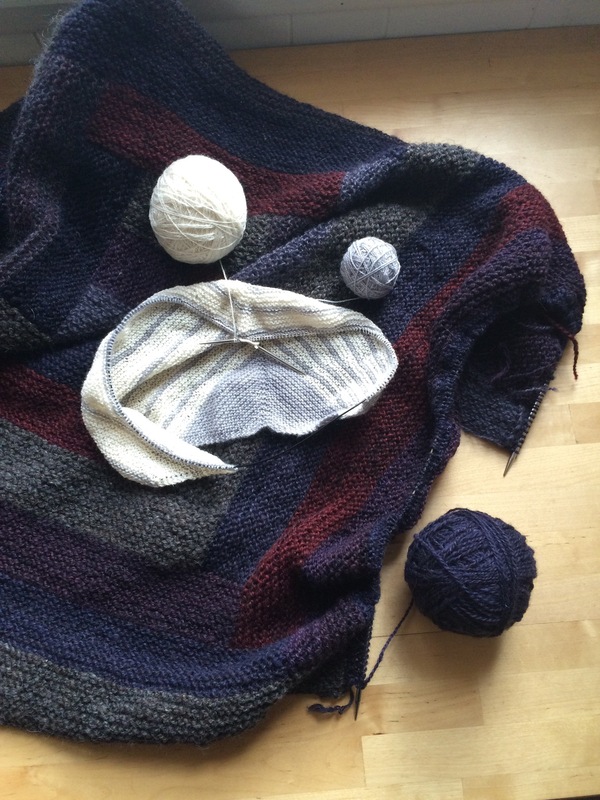 The garter stitch log cabin blanket in an assortment of handspun yarn hasn’t been ripped out yet, but it will be. 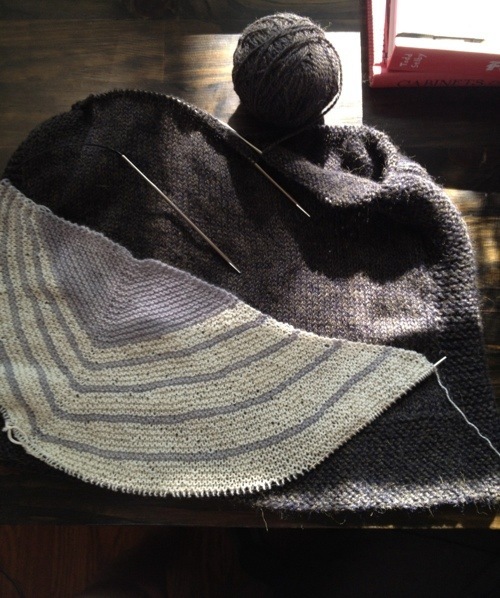 I had started it sort of on a lark, as an easy project to have on hand whenever I wanted something I wouldn’t have to think about, and I didn’t give much thought to the layout of the colors. 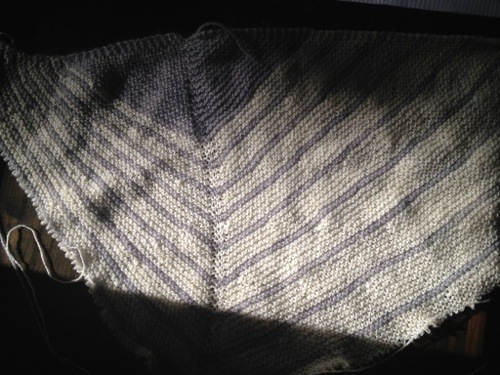 I’m not thrilled with how the light and dark shades have ended up and I’m also realizing that I don’t have quite enough yarn to make a decent-sized throw. I think I’m going to use the yarns in something woven instead. I do really love the way the colors look together and something like a plain-weave blanket woven in panels will showcase them nicely. Plus, just using them as weft will allow me to make a bed-sized blanket. 1. Current projects on the needles: a Cobblestone pullover in some gorgeous Blue Sky Alpaca melange I was lucky enough to get when a friend was cleaning out her stash. I think it’ll make a really great knockaround sweater for this fall. I’m making the smallest size and my gauge is a little tighter, so it won’t be as loose-fitting, but the drape of the alpaca is so fluid and dreamy, I think it’ll still read as a relatively flowy garment. And my Stripe Study is back on track. I tried a few different cream yarns, but preferred my original selection (Swan’s Island merino/silk) in the end. It’s a little lighter weight than the gray, but I don’t have anything in the stash that’s the right color and the exact right grist; the Blackberry Ridge wool/silk I tried was a little heavier and that looked inelegant and clunky, while a couple of other wedding-dress-option yarns whose labels are lost were even lighter than this. I think it’ll even out pretty nicely when it’s blocked, anyway. 3. I know it’s hot and humid and so very, very July out there, but I have fall knitting on the brain already. Partly, I think it’s because I’ve been dipping my toes into Project 333, which really deserves a post of its own–I think I’ve mentioned it before, but the idea here is that you choose 33 items, excluding underwear, workout clothes, and sleepwear, and that’s what you wear for the next three months–and I’ve been thinking about what sweaters I’d want in a very limited wardrobe. When my friend Rachael did Project 333, she didn’t count handknits at all toward the 33 items, but I already give myself so many outs, I’d like to reign myself in a little if I can. So for fall, I’d really like to have a black Baby Cables and Big Ones Too. It’s patterned enough to be interesting, but not so much so that it would look weird with patterned clothing. And I’d like a fair isle cardigan in a relatively small gauge with small geometric patterns in natural sheep shades of gray, white, and black and raglan sleeves. I haven’t been able to find one that meets my specifications, so I’ll have to come up with one. This is the closest I’ve come across, but the gauge is too big and it has drop shoulders and while I love the cross motifs, I’m not wild about the floral ones. I have the cable pattern and some gorgeous black Italian finewool on cones that’ll be perfect for it, so should start that sooner rather than later. 4. A few things I’ve enjoyed lately: Rosamund Hodge’s debut novel, Cruel Beauty, which mixes Greek mythology and the Beauty and the Beast story in very smart, well-crafted story. Happy hour at Maison Premiere in Williamsburg, where I enjoyed some $1 oysters and a couple of French 75s yesterday while sitting at a marble bar with my husband in one of the prettiest spaces in New York City. And I finally watched Frozen, which is thoroughly charming. I was struck by the fact that Elsa has gotten so much attention when it’s really Anna’s story–she’s the one who meets new people and goes on the quest and makes things happen. Elsa spends most of her time shut away, either in her room or in her fancy ice castle. 5. My office is moving this weekend from west SoHo to the Financial District. I don’t really know that part of town very well and am looking forward to exploring a bit. I know about Les Halles and The Dead Rabbit, but any other leads on good places for lunch/after work/interesting things in the neighborhood would be much appreciated. I’ve been working on this Stripe Study off and on for a few months. 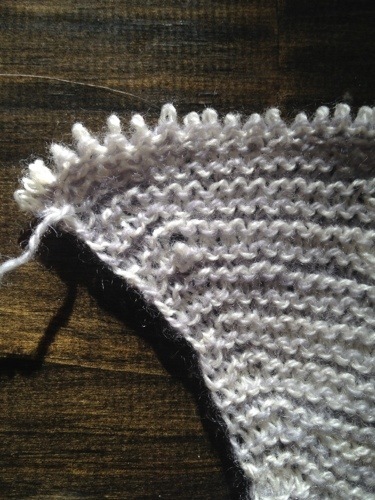 I had a bit of trouble getting going with it — hard a hard time figuring out a way to do the short row wraps that I was happy with — but eventually got it down and was sailing along. The yarn is super gorgeous; the gray is Jade Sapphire’s cashmere in Tanis Grays and the cream is Swan’s Island merino/silk, which was one of the yarns I was considering for my wedding dress. Then last night I realized I’d dropped a stitch about an inch back and there is no way to ladder it back up through the stripes that will look neat enough to satisfy me. So it’ll get ripped back again. I would be a lot more disappointed, except that this will give me a chance to fix something that’s been bugging me about it: the yarns are not quite the same weight. The cream is a little lighter than the gray, so those sections are slightly sheer. I don’t think it would be especially noticeable in the finished scarf, but I’m happy to have a chance to use something else. I have a skein of Blackberry Ridge’s wool/silk (which was also in the running for the dress) that’s a little heavier than the Swan’s Island and I think will be an excellent match for the cashmere.